The 25th Epcot International Flower & Garden Festival is underway, and this year we thought it would be fun to concentrate on the real stars of the festival, the topiaries. They're not necessarily new this year, for the most part, but we only get to see them during the festival, so it's good to get out and enjoy. Part of our fascination with the topiaries is because we spent some time way back a few decades ago trying to cultivate topiaries of our own, from our home in central California. All we can say is that it was a total and complete failure. 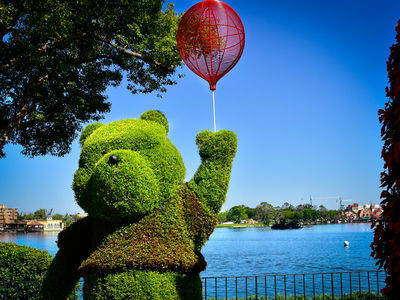 It seems that raising topiaries is a full-time job, and we already had jobs at the time. 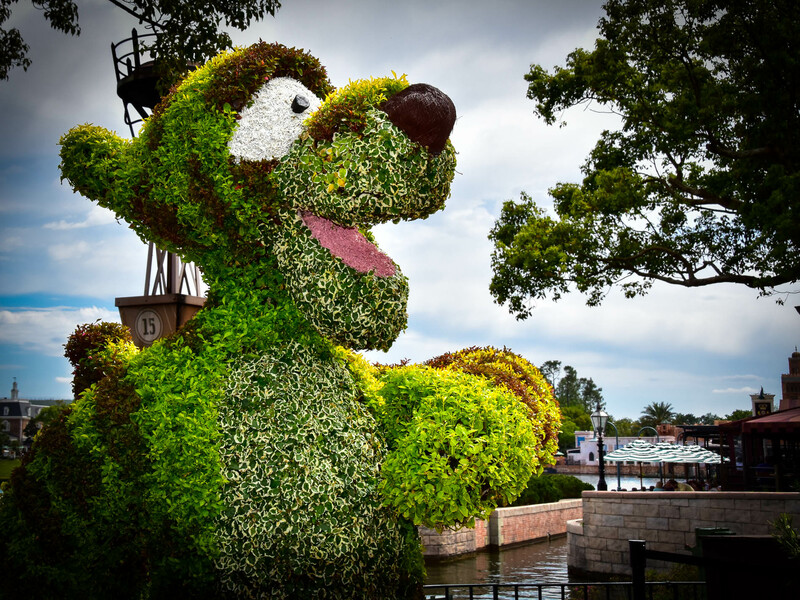 Here are our favorite topiaries from this year's International Flower & Garden Festival. They're not necessarily new, but they're always a treat. 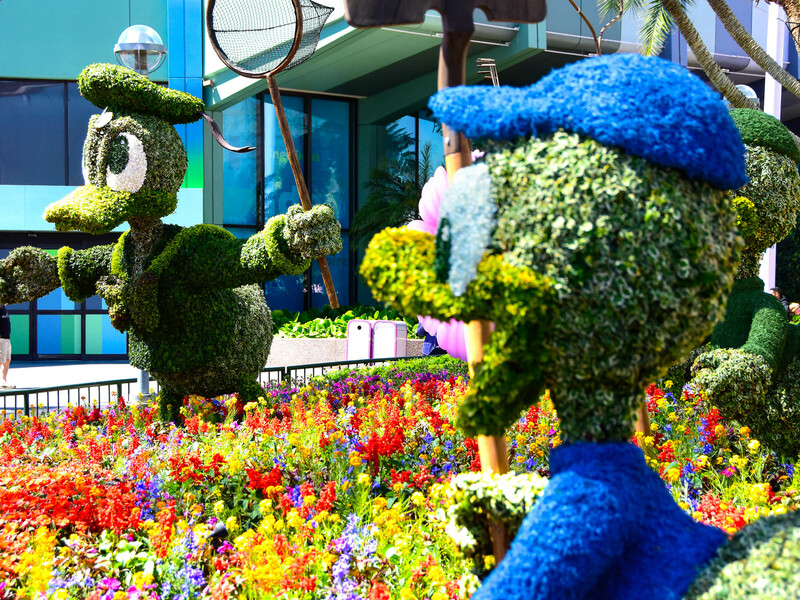 Minnie, Mickey, Pluto, and Goofy welcome guests to the 2018 Flower & Garden Festival. There are over 30 varieties of flowers, plants, and other garden materials in this scene, so even though it's at the very front entrance, it's worth a stop to take it all in. Nothing like a first impression. Photo by Bonnie Fink. 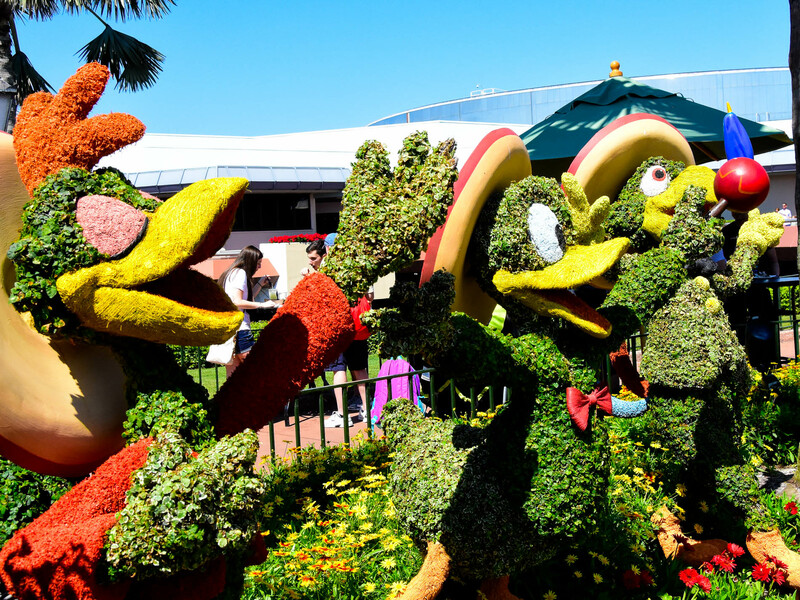 Donald Duck and his nephews are behind Spaceship Earth, chasing butterflies. Photo by Donald Fink. Near the Epcot Character Spot, and behind the Goodness Garden Butterfly House in Future World West, you will run into Daisy with Chip 'n' Dale. Photo by Bonnie Fink. You will find Stitch near Mouse Gear. Photo by Donald Fink. 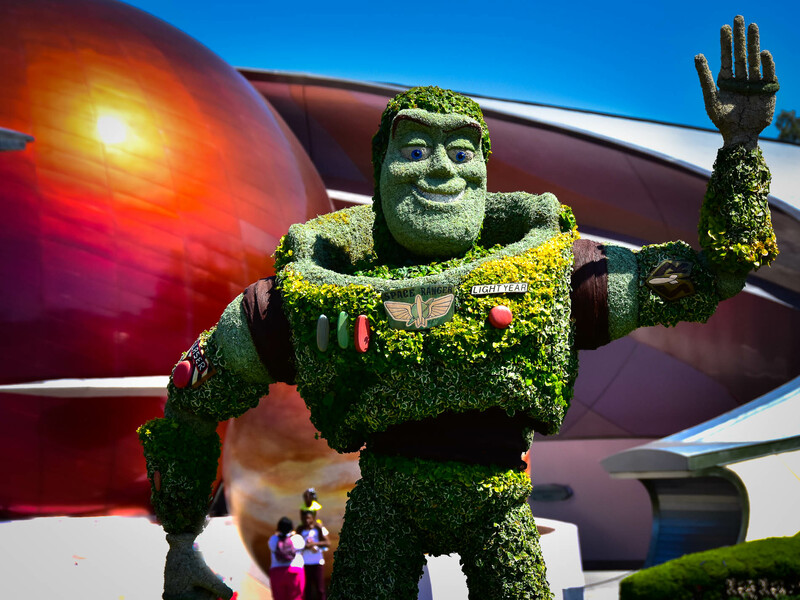 Buzz Lightyear greets you just before entering Mission Space in Future World East. Photo by Bonnie Fink. 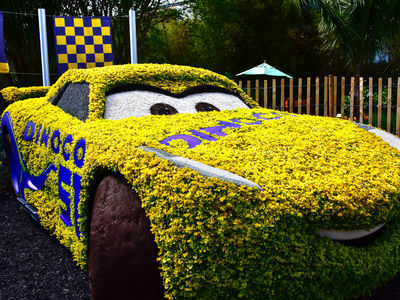 Cruz Ramirez is getting ready for the Florida 500 near Test Track. 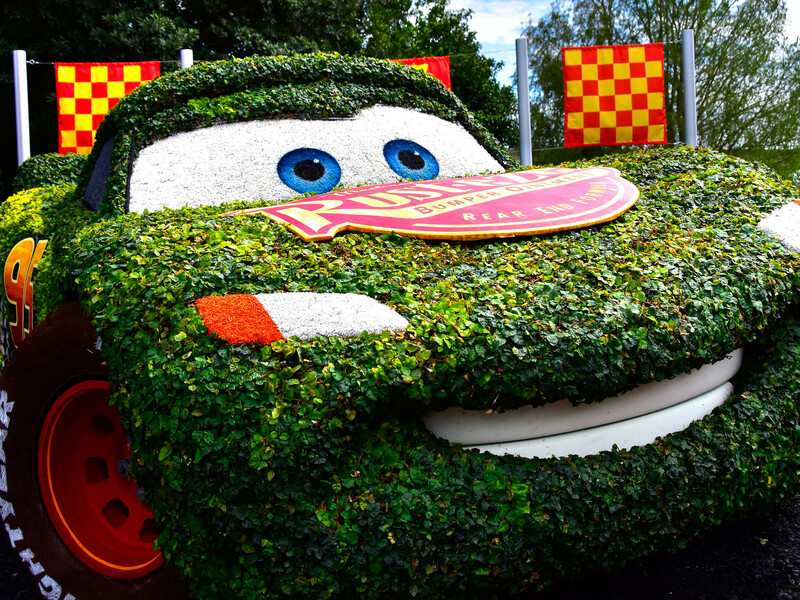 This is Ms. Ramirez's second year appearing at Epcot, and while we like her just fine, we still miss Mater. Photo by Bonnie Fink. 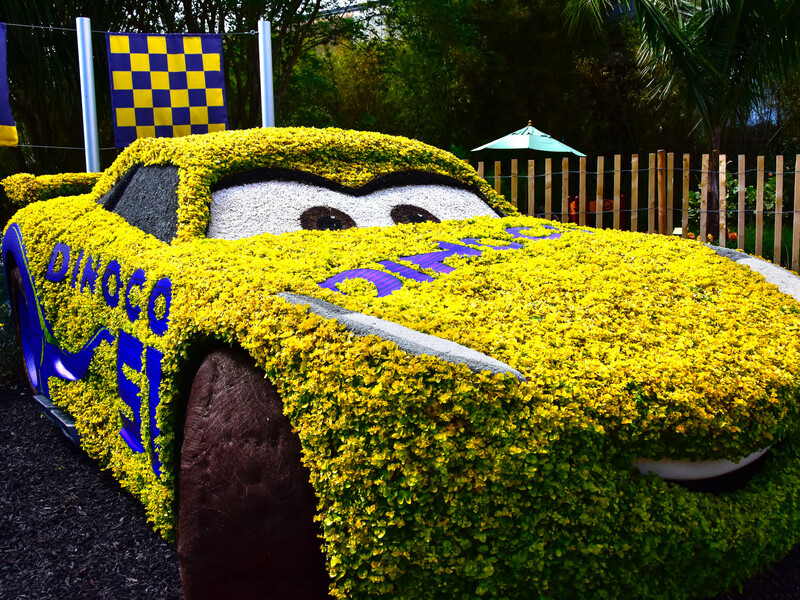 Lightning McQueen is ready to race near Test Track. Photo by Bonnie Fink. 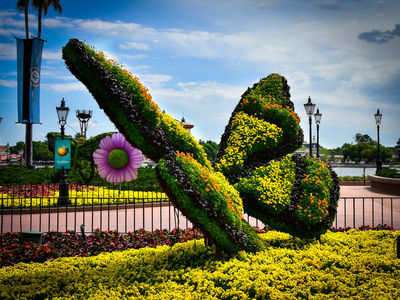 You can spot several butterflies in Showcase Plaza and near the butterfly house. Photo by Bonnie Fink. 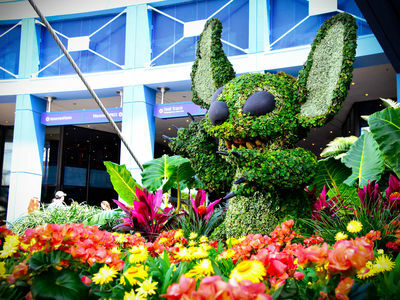 Did you know there are over 500,000 plants, trees, and shrubs planted for the Flower & Garden Festival each year? 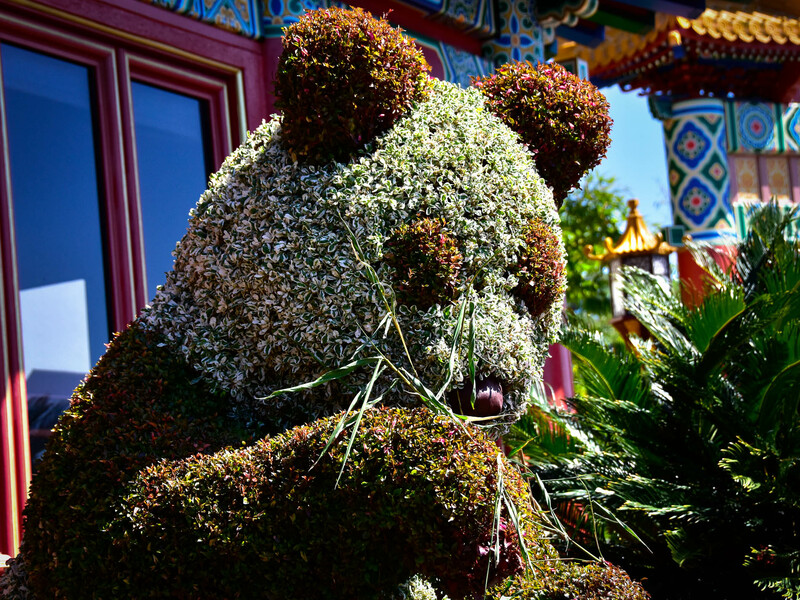 Of those, 250,000 are annual blossoms. 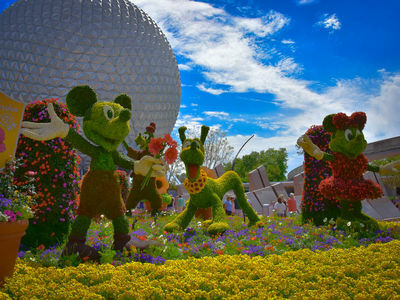 This year, because the festival runs for 90 days, there will be two crop rotations to keep the flowers fresh for the entire event. That seems like a lot of effort, but that's Disney. There were over 400 horticulturists needed to transform Epcot into the Flower & Garden landscape we see during the festival, and it takes 100 cast members dedicated to maintaining the gardens. 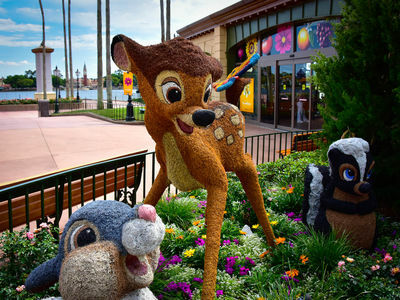 Bambi, Thumper, and Flower can be found at Showcase Plaza near the Port of Entry. Photo by Bonnie Fink. 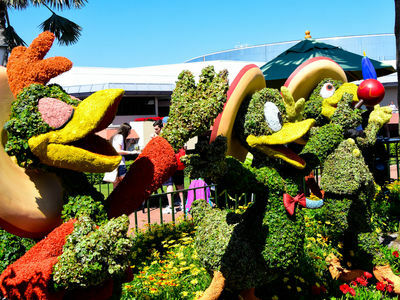 The Three Caballeros serenade guests on the way to Mexico from Showcase Plaza. Photo by Donald Fink. 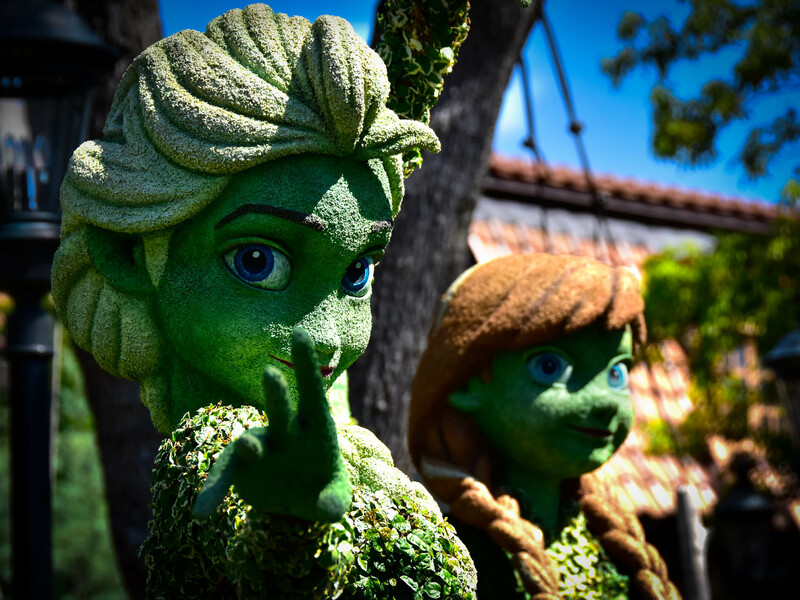 Anna and Elsa are in Norway. 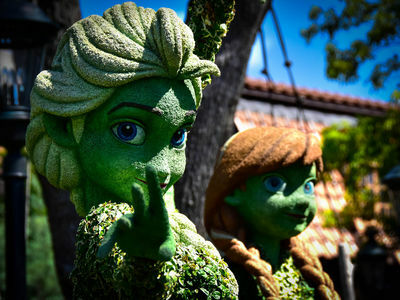 This garden might be interesting at night since it's wired to sparkle as Elsa works her magic in a snowy garden. Photo by Bonnie Fink. 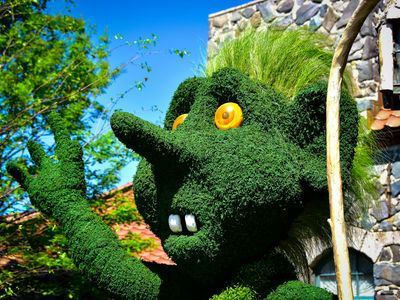 Where else would you find a troll but in Norway? Photo by Bonnie Fink. 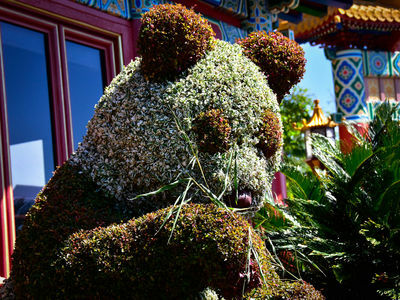 The mother panda is enjoying some bamboo shoots in China, and if you look closely in the flower bed you will find two cubs. Photo by Bonnie Fink. 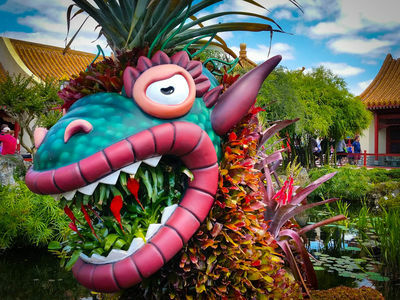 If you walk into China, you will find the bromeliad dragon. Photo by Donald Fink. 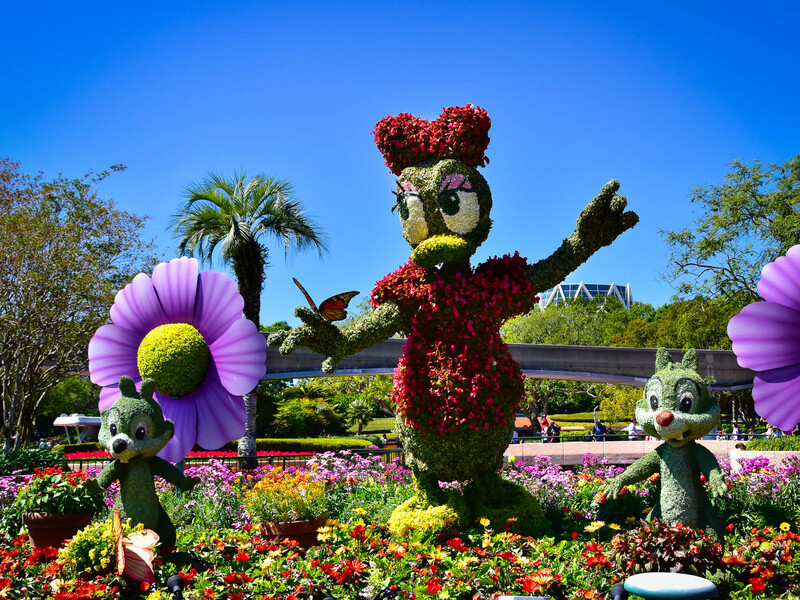 The name "bromeliad" refers to the kind of plants that are used to make up this display. Bromeliads are a family of succulent with a wide range of colors, from green to deep reds and purples. There are over 3475 species of bromeliads that grow mainly in the tropical Americas. Interestingly, pineapple is a bromeliad. 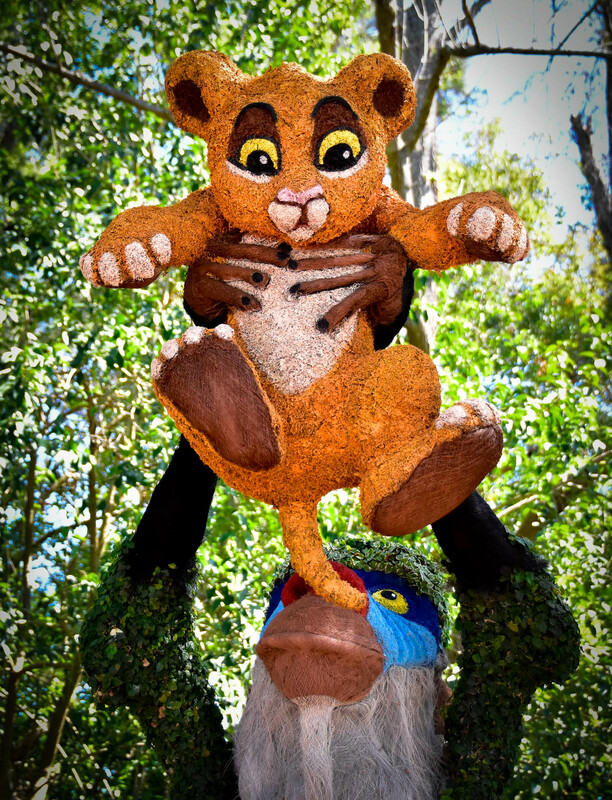 Rafiki and Simba can be found near the Outpost. Photo by Bonnie Fink. 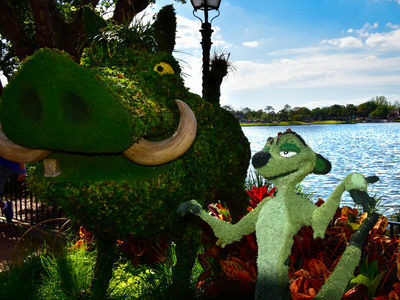 Timon and Pumbaa are also found at the Outpost. Photo by Donald Fink. You can only see Snow White and four dwarfs, but don't worry the other three are hiding behind a bush. 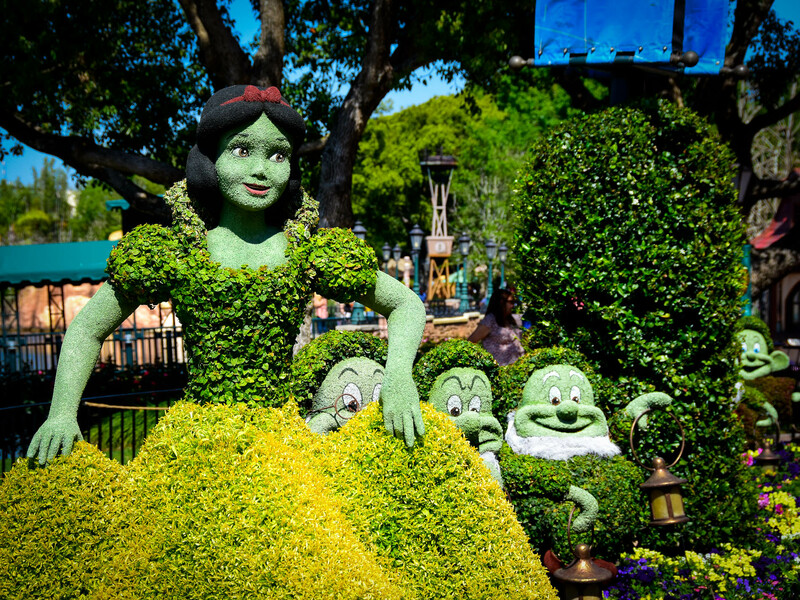 You can find Snow White and all seven of the dwarfs in Germany. Photo by Donald Fink. 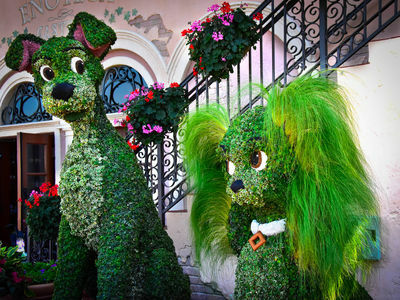 Lady and the Tramp can be found in Italy. 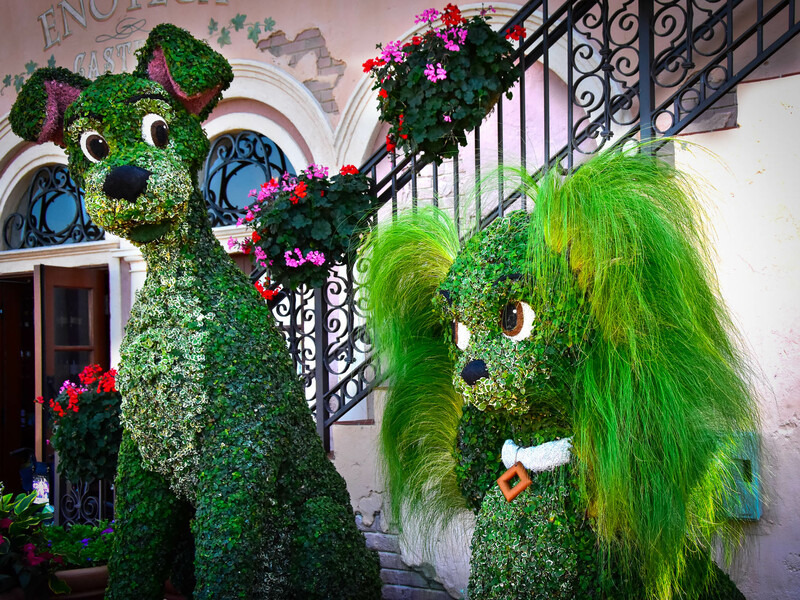 It's one of our favorite displays because of the flowing grasses that make up Lady's ears. Photo by Bonnie Fink. 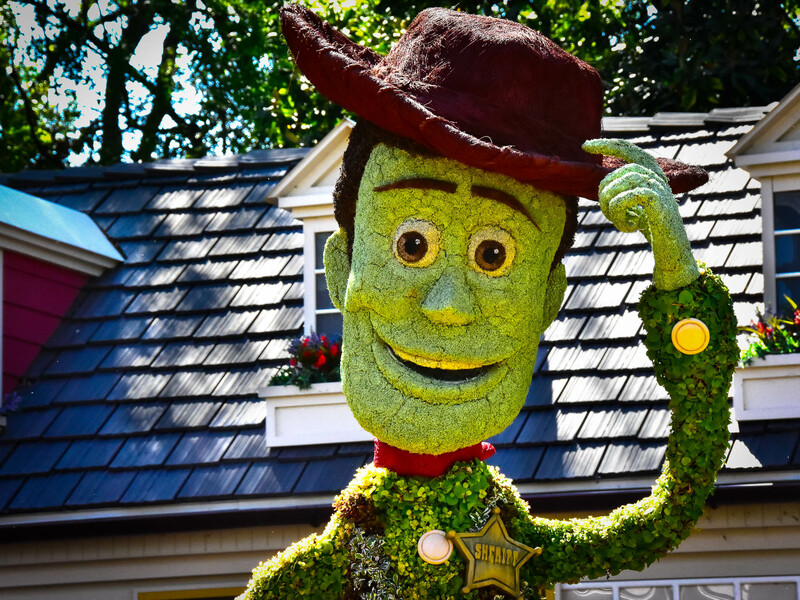 Woody, as in years before, is in the American Adventure, near the Smokehouse. Photo by Bonnie Fink. You can't miss Beauty and the Beast in France. They're located just behind the fountain. Photo by Bonnie Fink. 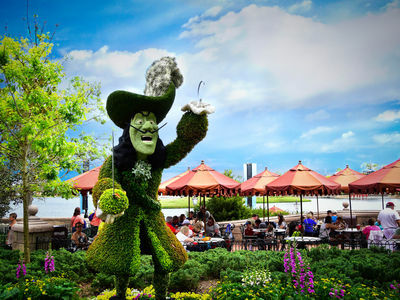 Captain Hook is located in the United Kingdom. Photo by Donald Fink. 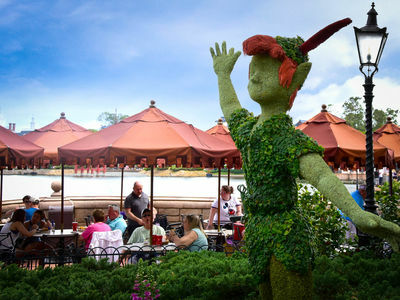 Peter Pan and Captain Hook are located in the United Kingdom garden normally reserved for the teapot and cups, overlooking the seating area near the Yorkshire County Fish Shop. Photo by Donald Fink. 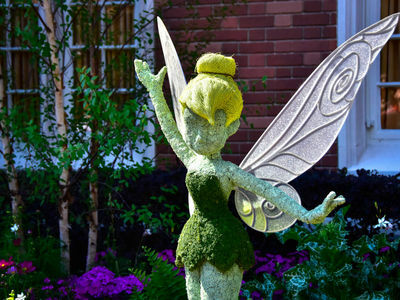 Tinker Bell is in the United Kingdom, with the fairy houses. Photo by Bonnie Fink. 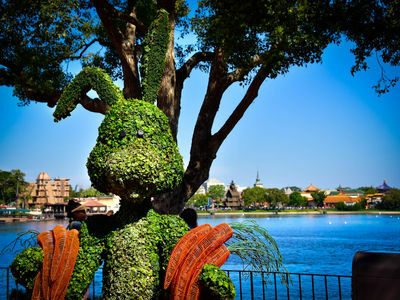 Rabbit—Winnie the Pooh's friend—is enjoying carrots in the United Kingdom. Photo by Bonnie Fink. 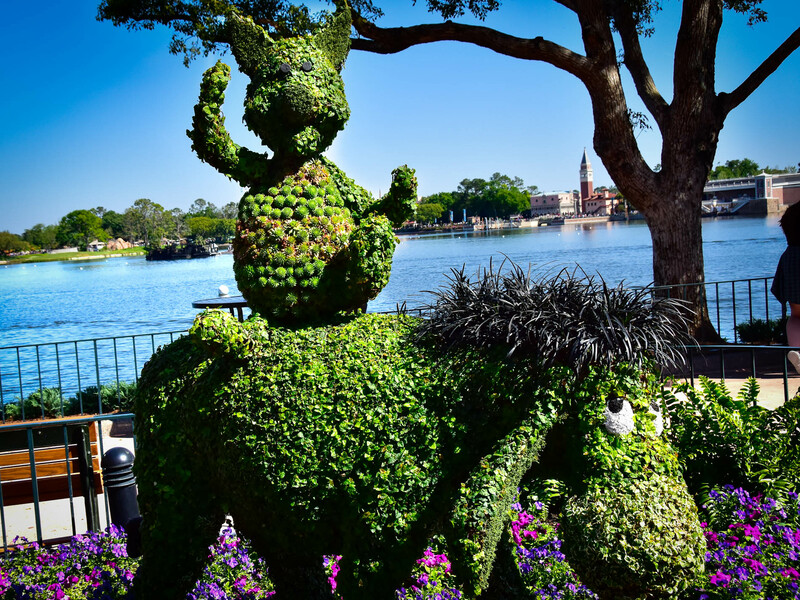 Piglet enjoys a ride on Eeyore's back in the United Kingdom. Photo by Bonnie Fink. Winnie the Pooh is ready to float away with a red balloon in the United Kingdom. Photo by Bonnie Fink. Tigger strikes a pose in the United Kingdom. Photo by Bonnie Fink. 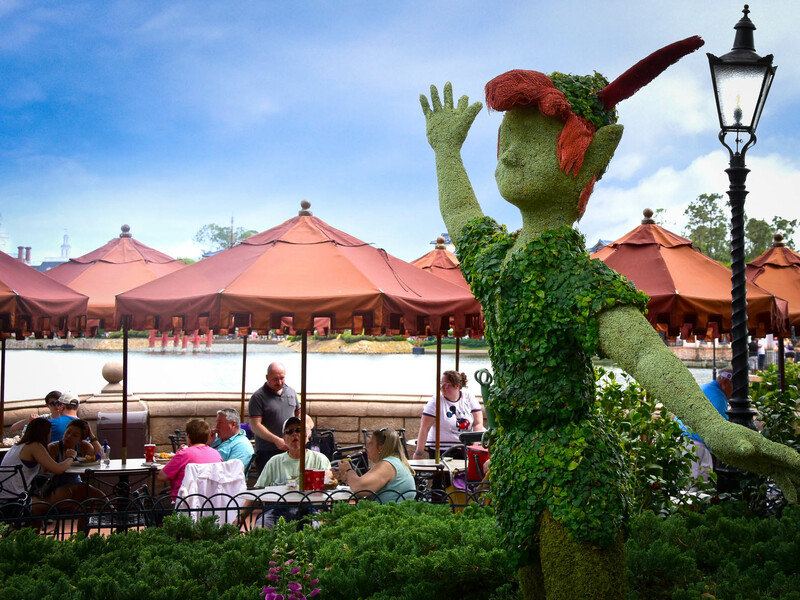 There are 15 outdoor kitchens with over 70 different beverages and 40 featured food items. One outdoor kitchen to be sure to see is the new Honey Bee-stro. It's located along the walkway from Future World West to Showcase Plaza. The kitchen is sponsored by the National Honey Board and features dishes like their local wildflower honey-mascarpone cheesecake with orange blossom honey ice cream. For a beverage you might try a honey-peach cobbler freeze, served with blueberry vodka. We can't forget the Garden Rocks Concert Series. This year you'll find old favorites like Herman's Hermits (May 4 through May 7), but you'll also see seven new artists. We're looking forward to Jo Dee Messina, being country fans like we are. She's appearing on April 20 and 21. 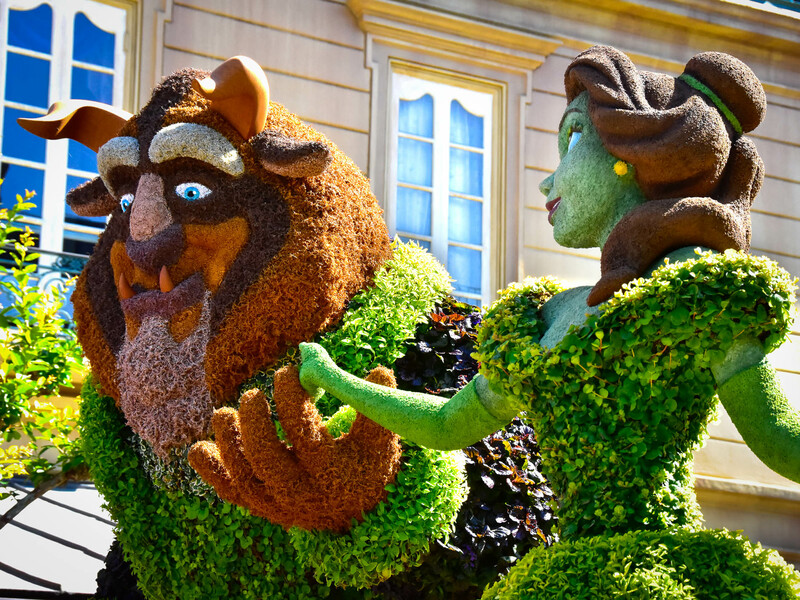 Whatever your pleasure might be at the 25th Epcot International Flower & Garden festival, be sure to stop and admire the flowers and especially the topiaries. 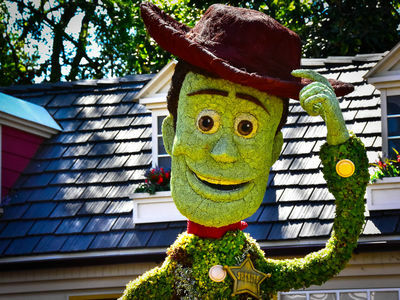 When you're standing in the American Adventure pavilion admiring the topiary of Woody, the Shipyard Maple Stout you might be sipping might just seem normal. Here's a quick video we made while we walked through the Flower & Garden Festival enjoying the topiaries. Those of us who spend time at Disney tend to overlook these incredible works of horticultural art, but they're remarkable and fun to admire. Video by Donald Fink. Nice pics, and excellent video. I'll see it all for myself tomorrow!! !